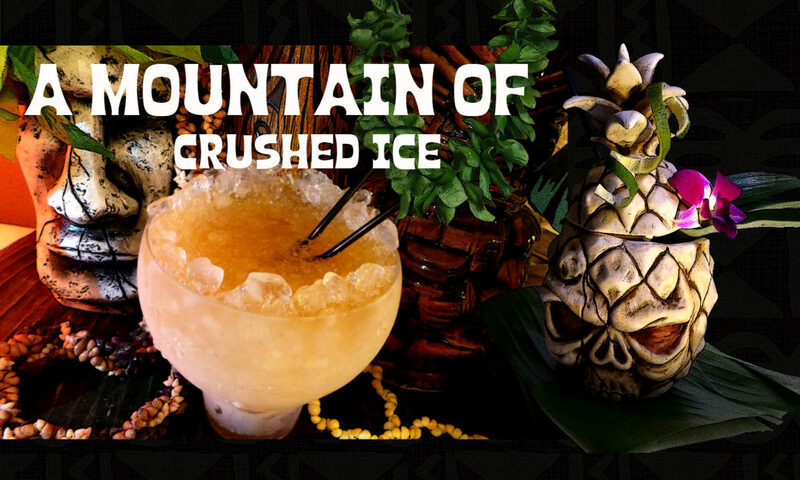 The Coconaut is a very tasty Tikidrink which i like a lot. This evening i was going to let some friends taste this drink and i wanted a nice garnish. 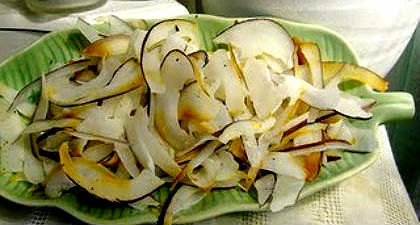 So what would fit better than some toasted shaved coconut? Usually the only coconuts that can be found here are those brown ones…but that is ok as the brown edge is nice on the coconut shavings when used for garnish. To crack open one of those brown coconuts is easier than most people think. All you need is a coconut, a bowl and a large cleaver. Hold the coconut over a bowl in one hand such that the middle of the nut rests in the middle of your palm, with the tip on one end and the eyes on the other. Now, whack the coconut with the back (that is to say the blunt side) of the cleaver a few times all around the center until it cracks open cleanly into two nearly equal halves. Make sure you use the blunt side of the cleaver. Catch the juice in the bowl as it drains from the cracks. After the nut was cracked, (it took 1 minute), i shaved the flesh with a potato peeler making sure to get a little bit of the brown shell. 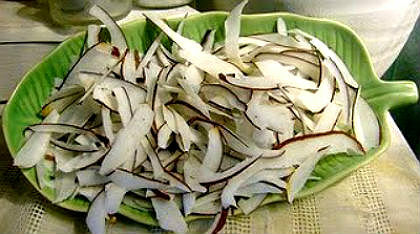 The shaved coconut pieces can be toasted to a golden brown so they become crispy and have more flavor. Let toasted nuts cool completely before using. They can be stored, covered, in a cool, dry place for up to 2 weeks. 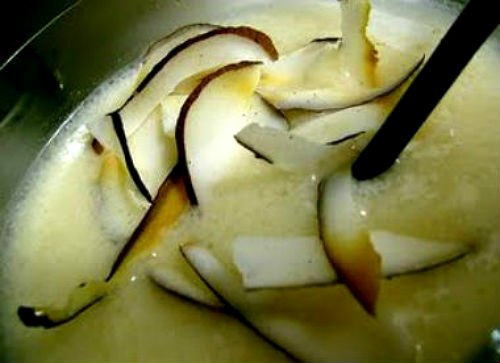 OVEN: Spread the coconut pieces evenly in shallow pan. Bake in preheated 350 degree F oven 5 – 7 minutes or until golden brown. Stir frequently and don´t leave unchecked. MICROWAVE: Spread nuts evenly on microwave-safe plate. Microwave on high 1 minute; stir. Microwave on HIGH, checking every 30 seconds, until nuts are fragrant and browned. Now the coconut was sorted out, so on to the drink, the Coconaut! The recipe in Grog Log calls for Lopez coconut cream and of course that`s one of those things i cannot find here so i used the only thing available, Opies “cream of coconut”. Its very sweet so i used a bit less. This is blended with dark Jamaican rum, i used Appleton VX. I could have used the Extra or Reserve but i have more of the VX left.. And then the fresh lime juice, i LOVE fresh lime Juice! 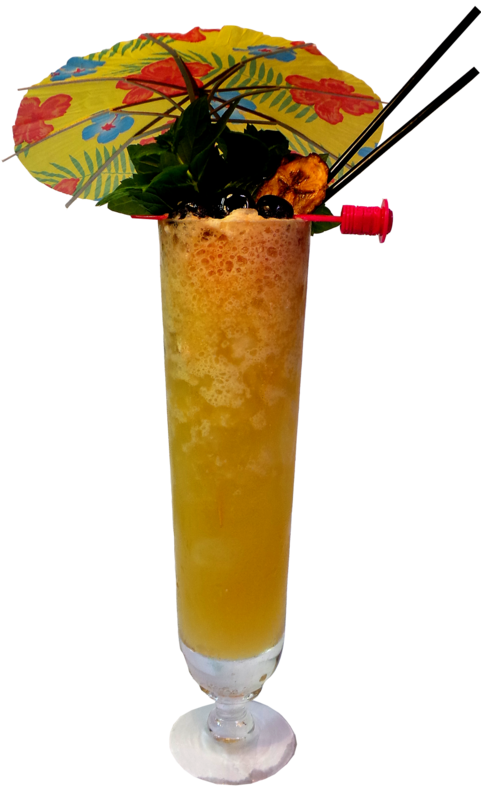 COCONAUT from Beachbum Berry`s Grog Log, serves 2-4. 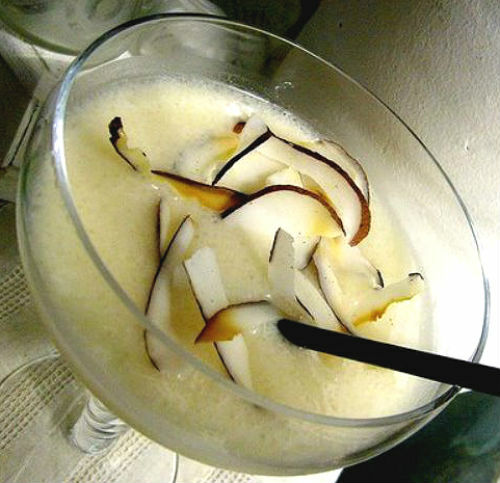 The toasted coconut pieces proved to be a excellent garnish as it was not only nice to look at but also very very yummy to snack on right out of the drink. Preheat oven to 350F and prepare a baking sheet by rubbing with butter. 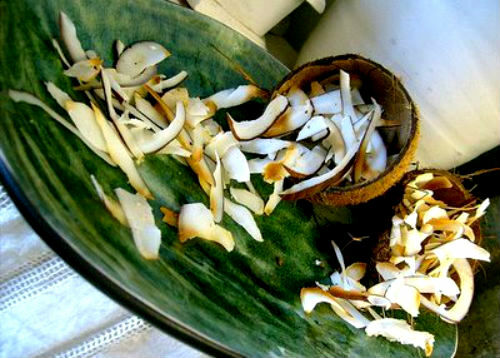 Open the coconut and shave into thin slices and bake them as described above. Then sprinkle with sea salt and serve in an empty coconut shell. 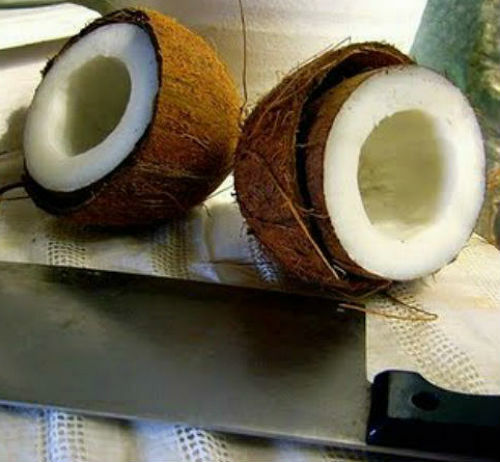 As this is a coconutty post i finish with a coconutty drink…i was lucky to find a fresh green coconut and sometimes the simple things are the best..
To easily open a fresh green coconut all you need is a cleaver and a chefs knife. You first cut off a piece from the bottom to make the nut stand steady and then you “shave” the upper part of the nut to form a top which you cut off. Then pour some rum in the nut and chill it in the freezer for a while before adding a straw and maybe squeezing some fresh lime on top. The first suggestion seems the best to me…and even though i have Coco Real here i think i`m gonna try and see how it turns out. Maybe someone of my readers have a good recipe? Hi… Do you have a recipe for homemade cream of the cocnut?? Shirow66 – That´s great! its a very tasty drink indeed! Camper – And then its easy peasy Cheers! Paleiko – Absolutely! the recipe says dark jamaican rum..i believe a mix of the two might be good too..
Do you think Coruba Jamaican Rum or Smith & Cross is also suitable for this Drink? I made the Coconaut yesterday, having finally gotten some Coco Lopez. I used Appleton V/X because I didn’t dare try using Myer’s because of the potential spoiling in taste. It was fantastic! I halved the recipe and it filled my glass to the very top. This is one of my top drinks for sure. Coco Lopez does just seem to be coconut milk mixed 50/50 with sugar though with a little bit of salt and additives. Probably easier and cheaper making your own. 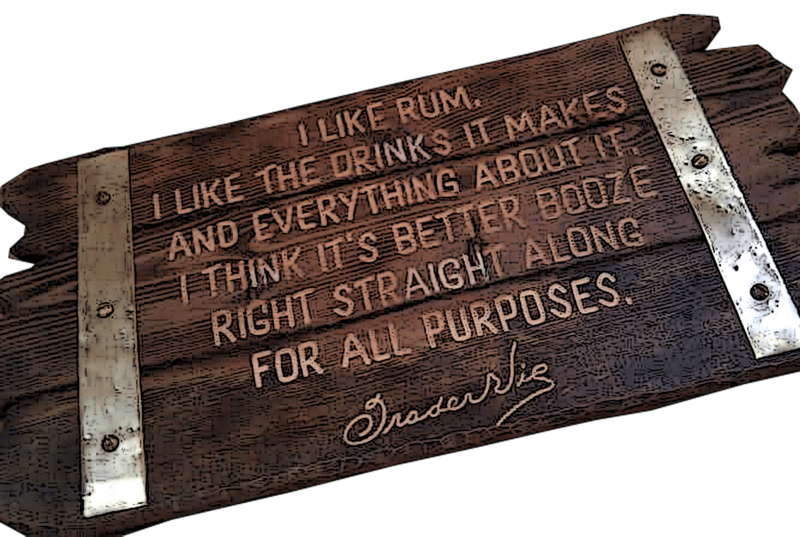 Next time I’ll probably try using the Pusser’s 115 proof for this should work well in a Painkiller type way. 2009 will be the year I learn to open a coconut! But first I need to buy a cleaver. Next PostNext Penang Afrididi and a Fried Fish!